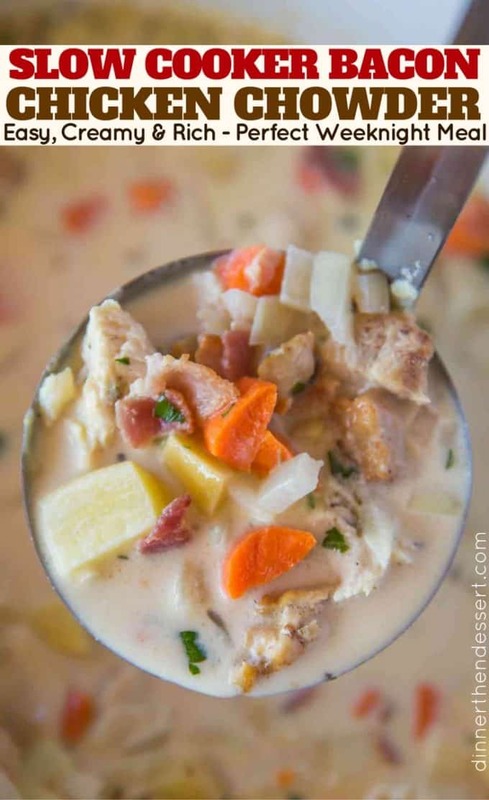 Slow Cooker Bacon Chicken Chowder cooks low and slow all day long for a hearty, easy rich chowder with lots of bacon. 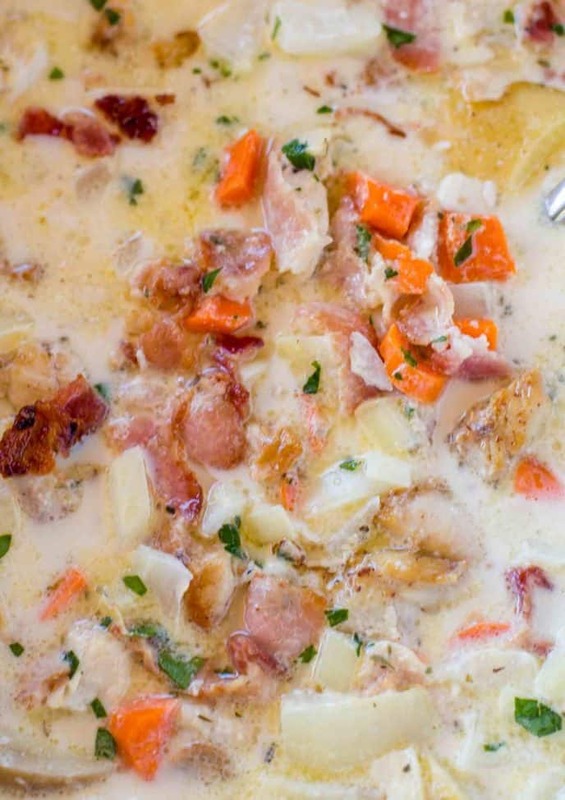 Slow Cooker Bacon Chicken Chowder is a dish that is deceptively easy and rich. Aside from crumbled bacon theres no precooking involved either! We’re a huge fan of soups during the cold wintery months (ok ok, it isn’t that cold in California but I reserve the right to feel like this kid from the Campbell’s Soup snowman ad). One of my favorite things about soups is cooking them low and slow. I think we’re so used to fast meals done in 30 minutes sometimes you forget the great flavors that come from simmering something on the stove. Except no one has time for that! Especially not during the holidays. 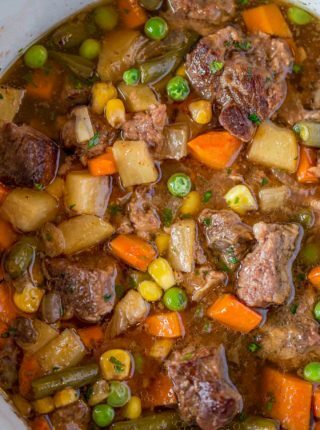 So Slow Cooker Soups are HUGE for us. 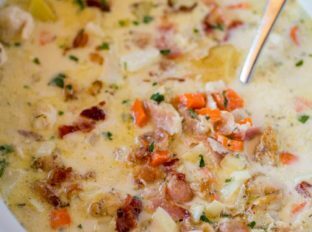 The most popular one on the site by far is the Slow Cooker Ham and Potato Soup and this one is a similar style, full of thick, rich, creamy flavors! 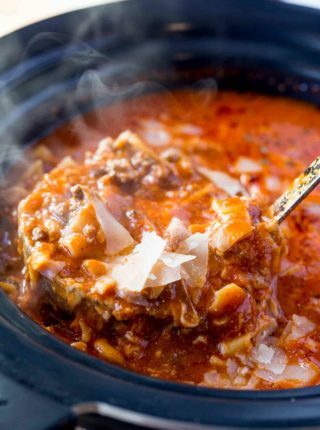 Especially in a slow cooker the most important thing is bold flavors. I love bacon, extra chicken base, cream cheese, heavy cream and garlic in this dish together. Pump up the flavor even more, cook the onions in the bacon fat before adding them to the slow cooker. I used chicken breast here because more of my clients liked white meat, but chicken thighs are an obvious swap here too. Turkey meat is a great swap as is shrimp. 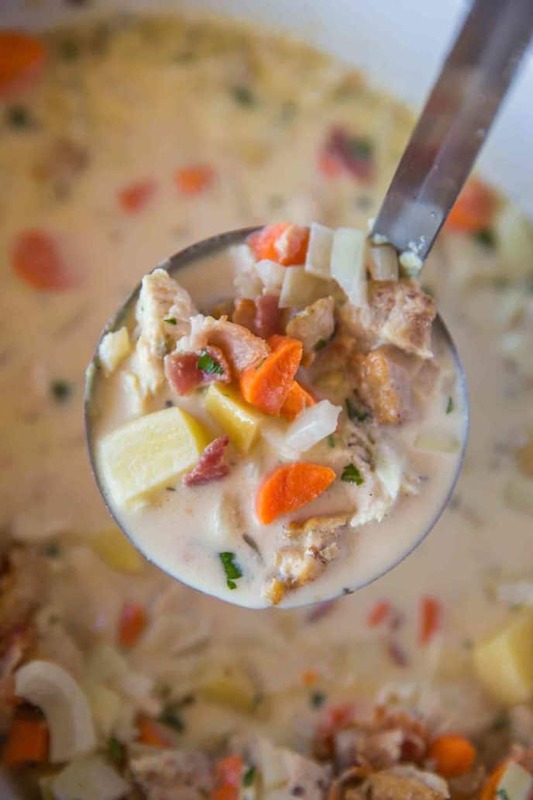 If making a shrimp and bacon chowder, add in the shrimp in the last 20 minutes and use a seafood base instead of chicken (Like fish, clam or lobster – I use lobster and it is AMAZING). Yukon potatoes are rich and buttery and hold up well in the slow cooker. 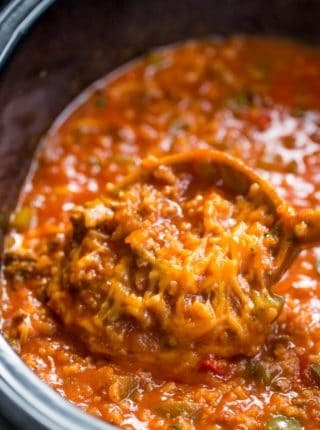 Slow Cooker: Love this slow cooker and how programmable it is, it has been a workhorse for me. Pig Tail Flipper: I use this to flip bacon easily. I use this tool EVERY time I cook something that requires flipping, it is amazing. 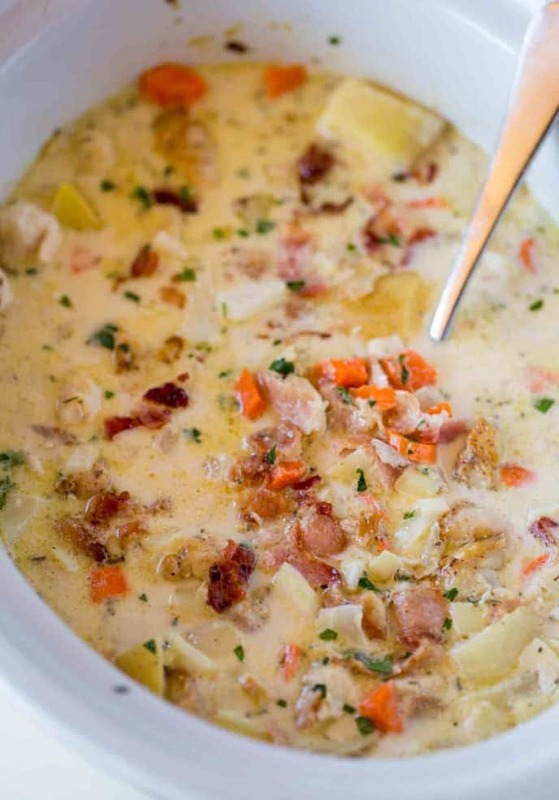 Slow Cooker Bacon Chicken Chowder cooks low and slow all day long for a hearty, easy rich chowder with buttery potatoes and lots of bacon. 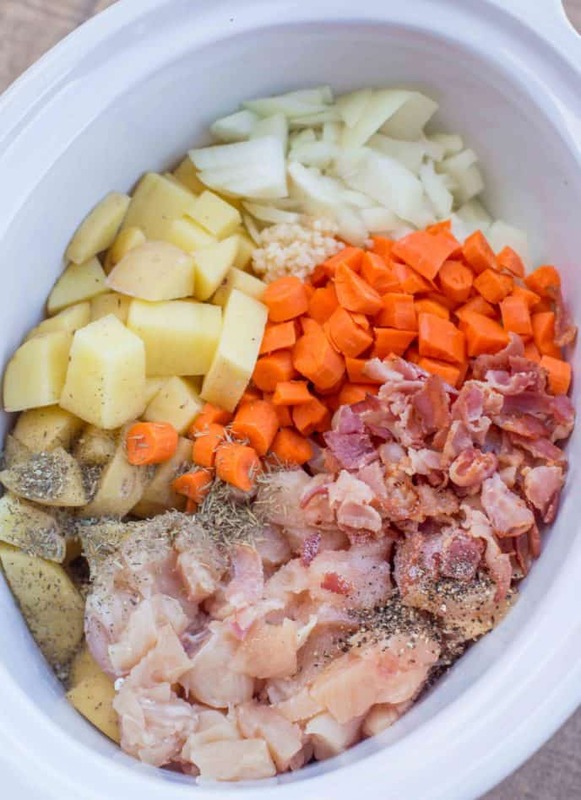 Add the chicken, onion, garlic, potatoes, carrots, salt, pepper, broth, thyme, oregano and half the bacon to the slow cooker. Add the cream cheese to the slow cooker. Mix the cornstarch with the heavy cream and add it to the slow cooker. Mix in the remaining bacon and serve. *Instead of broth I use Better than Bouillon. So I'd add double the strength it calls for to get an even more rich flavor. This sounds great – I’d like to start making it for tonight but don’t have 7 hours until dinner time. Can I cook on high with the same results, you think? If so, how long would you recommend? I prefer low and slow but if you’re short on time, cooking it on high may still take 4-5 hours. Enjoy! I love the sound of this recipe but I have a problem. I am lactose intollerant. I can get lactose free cream but have yet to find a cream cheese. Could I use a white cheddar (I can tolerate this) in place of the cream cheese. I am from Wisconsin and the wind chills this week can go as low as -50. 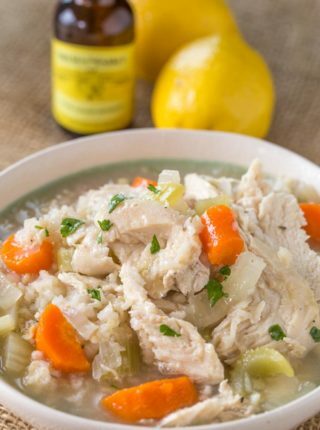 When I saw your recipe for slow cooker chicken chowder, (which is the first of yours I am trying), I could not resist making it. It sounds fabulous just like the majority of your recipes. thanks. Stay warm! I hope you enjoy it! Will cauliflower work instead of potatoes? Can I leave out the corn starch and still have a creamy soup? It will work to a point, it won’t work as well as you or I would hope as cauliflower can never really replace the delicious creamy texture of a potato. If you leave out the cornstarch you’ll need additional thickening to create a thicker soup. You may be better suited to just start with a healthier recipe instead of starting from this base. Love this recipe. There are so many ads on the mobile version though I finally gathered ingredients and just plopped them all in. Would love to be able to read your posts without so many pesky ads. With that being said I’m sure you benefit from them and my whole family benefits from you sharing so I suppose it’s a fair trade 🙂 thanks for sharing! I accidentally added everything at once ????? is it gonna turn out bad? So sorry I’m just now seeing this! Hope it turned out ok.
I’ve been making a lot of your soups lately. My husband works out in the middle of no-man’s land and it’s freezing! He always just packs a sandwich because a measly can of Progresso soup just doesn’t cut it out in the cold. I finally found a big 3 cup soup thermos and that was the ticket! Big enough to satisfy a big man and it warmed him up. You already know what fans we are and this soup did NOT disappoint! He loved the bacon! Fabulously flavorful! Yay!! 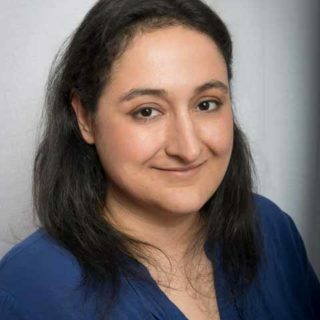 Thanks so much for taking the time to come back and let me know! Stay warm!! How much chicken bouillon did you use? How many cubes?? I don’t use the cubes, I use the base. I used 4 teaspoons of Better than Bouillon mixed with water to make the 4 cups of broth. Love the bacon in this! Made this tonight and it’s delicious. I added corn. Will make again! Does it freeze well with the cream?? I’ve never tested it but I’m thinking the cream mixed in with the potato won’t freeze very well. Sorry. I made this today. Perfect soup for a day in the teens. I changed things just a bit. I used a rotisserie chicken and just added the picked chicken near the end. My husband hates cream-based soups, so I had to change the amount of cream cheese and cream. Instead of regular cream cheese, I added a heaping tablespoon of chive cream cheese. (I love onions) and I reduced the amount of cream to about 1/4 cup. Also, I had used the oven earlier in the day and so I cooked my bacon at that time. I added the crispy bacon when I added the rotisserie chicken. I seasoned with poultry seasoning and a little chicken base. Don’t forget the cornstarch slurry – it makes it nice and thick. I think a few peas would be a nice touch. Maybe next time. Love that you were able to customize it to your liking! After so many parties with party food, I have been looking for a hearty meal to fix. My family thanks you! This is the perfect recipe for winter! Oh my! This sounds fantastic!! I am loving the bacon!! YUM!! oh, i love that you put the chicken in uncooked! what a timesaver!